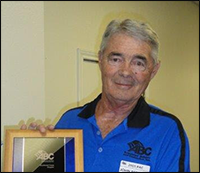 On October 6, 2015, at a Membership Meeting, and by majority vote, the Chapter’s Board of Directors bestowed upon John Bernard, the title of “President Emeritus”. This status is reserved to honor, a former Chapter President who has provided outstanding and distinguished service to the Association; that which goes above and beyond the normal duties and responsibilities of the appointment, and which have had extraordinary impact on the Association. Emeritus status is only given to an individual who has demonstrated exceptional commitment and contributions to the Association, exemplifying the highest standards of personal and professional integrity, civic responsibility, vision and leadership. ABC-Southeast Texas has never before given such an honor upon a past President. Everyone can agree, when you think of ABC, you automatically think of John Bernard. Congratulations to John for all that he has done, and continues to do, for this Chapter and the petro-chemical industry; he is indeed very deserving of this title! Network at ABC. Join Today! Click to download a membership application or call (409) 724-7886 for more information. Associated Builders and Contractors, Inc (ABC) is the only organization truly representing the interest of the Merit Contractor. With 21,000 plus members throughout the nation, we provide the strength in numbers to be heard on issues affecting the construction industry. ABC is the only national construction management trade association devoted exclusively to promoting and defending the "merit" form of construction. ABC is the only construction trade group that represents the entire construction team: general contractors, speciality contractors, suppliers and industry professionals. Our mission statement here at ABC is to deliver safe, quality, industrial/construction services, on time, at a competitive rate.